Bigasoft Real Player Converter for Mac is the best and easiest-to-use Mac Real Player video converter for RealMedia file conversion to convert RealVideo/RealAudio in RM, RMVB, RV, RAM, IVR, RA to AVI, MP4, MPEG, DivX, 3GP, MOV, WMV, MP3, M4A, etc. 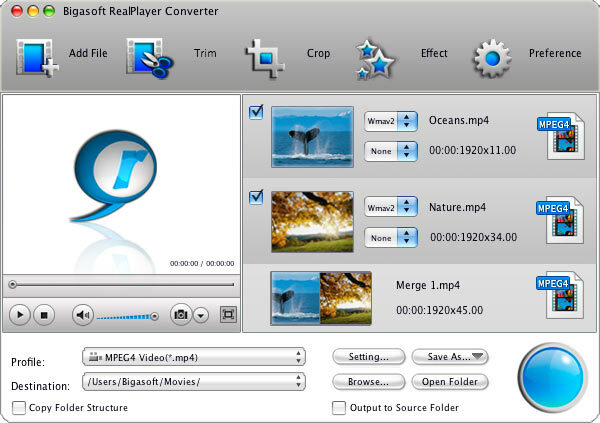 The RealPlayer Converter is powered with advanced features such as trim, merge, crop, split videos and adjust video image, bitrates, aspect ratio, and resolution, add water mark and subtitles and more. Qweas is providing links to Bigasoft RealPlayer Converter for Mac 3.3.22.4149 as a courtesy, and makes no representations regarding Bigasoft RealPlayer Converter for Mac or any other applications or any information related thereto. Any questions, complaints or claims regarding this application Bigasoft RealPlayer Converter for Mac 3.3.22.4149 must be directed to the appropriate software vendor. You may click the publisher link of Bigasoft RealPlayer Converter for Mac on the top of this page to get more details about the vendor.